A lot of important Mets things happened on Monday, the least of which was a 6-5 extra-innings loss to the Yankees in Game 1 of the Subway Series. Matt Reynolds hit a three-run home run and Wilmer Flores continued to destroy lefties with a solo shot off C.C. Sabathia. Curtis Granderson also showed off some impressive range in the outfield that we haven’t seen much of until now, probably proving he’s fully capable of manning center field when Jay Bruce gets here. Still with me? No? Anyone? Logan Verrett continues to be Not Matt Harvey, giving up three runs and four hits in five innings. It’s not bad per se, but three runs for a team who can’t buy runs seems insurmountable at this point. We have a few options for the messiest situation of the night. Okay, maybe more than a few. This list got away from be a little bit. 1) Addison Reed, who struck out Mark Teixeira for the second out in the eighth, then bookended a wild pitch with singles by Brian McCann and Didi Gregorius, allowing the Bombers to tie the game at 5. Luckily for the Mets, Reed has been practically untouchable all year, so he was due for a hiccup. 2) Seth Lugo loading the bases with no outs in the top of the 10th, allowing a Starlin Castro sacrifice fly to put the Yankees up 6-5. 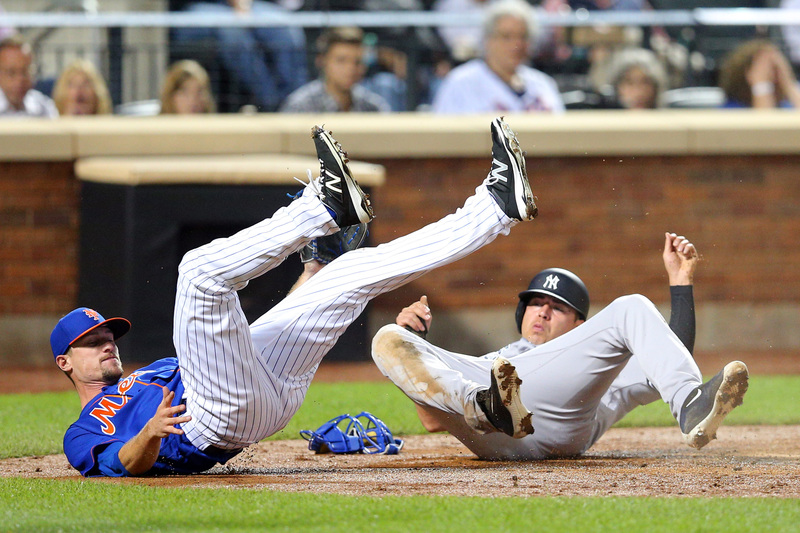 3) Justin Ruggiano, who pulled up lame after hustling down to first in the fourth inning. The newly minted Met landed on the DL shortly after the final pitch, so at least we know he truly belongs in orange and blue. 4) Terry Collins, who inexplicably wasted precious outs against Dellin Betances by calling for Reynolds lay down a bunt to move James Loney, who led off the bottom of the 10th with a double, to third. 5) The Mets front office, unable to time flights from Las Vegas — or some other perfectly rational explanation, I’m sure — played short once again with both Asdrubal Cabrera and Yoenis Cespedes unavailable. Steven Matz pinch hit in the sixth and drew a walk, which I guess counts as a success, but at some point there has to be a serious discussion about a nonexistent bench. Unfortunately, that conversation will probably come when one of the few healthy pitchers hurts himself playing a position he shouldn’t be playing.